Hello and welcome back to the links of the month. It has been a busy month for me. The downside of months like that is that I have a lot of ideas for blog posts, but not the time to write them. To make a long story short, stay tuned for some blog posts I hope I can publish in June. For now I have some blog posts for you which are worth reading. A special attention I want to pay to the post from Sara Soueidan, who has build an amazing demo of a web site which uses a Windows 8 Live Tiles-like style. Introducing a new Windows Dev Center experience – Like some of you maybe have already noticed the Windows Dev Center looks a little bit different then before. To see what has changed in detail check out this blog post. Latest Windows Phone app submissions improvements – Submitting an app is not always as easy as it should be. Luckily some improvements where made to improve the app submission for Windows Phone. For some details have a look at this post. Announcing the Release of WebMatrix 3 – I have to admit that I haven’t worked with WebMatrix a long time, but that has changed with the release of WebMatrix 3. 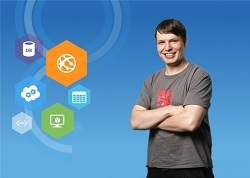 It provides an awesome Windows Azure and version control integration and I use it personally a lot for node.js projects. This entry was posted in English, Links of the month and tagged Links of the month, MVVM, Node.js, Visual Studio 2012, WebMatrix 3, Windows 8, Windows Azure, Windows Azure Mobile Services, Windows Azure SQL Database, Windows Phone on June 1, 2013 by Jan Hentschel.